Lucky 7's Greenhouse Sale on Now! Manufacturer's Rebate Sale on Now! Category: Cape Cod Series - On Sale, Cape Cod Series - Single Glass, Feature Greenhouse Models, Free Standing Greenhouse Kits, Single Glass Greenhouse Kits, The Parkside Greenhouse, Traditional Series - On Sale, More..
We are pleased to introduce The Parkside Feature Greenhouse offered at special discounted pricing. 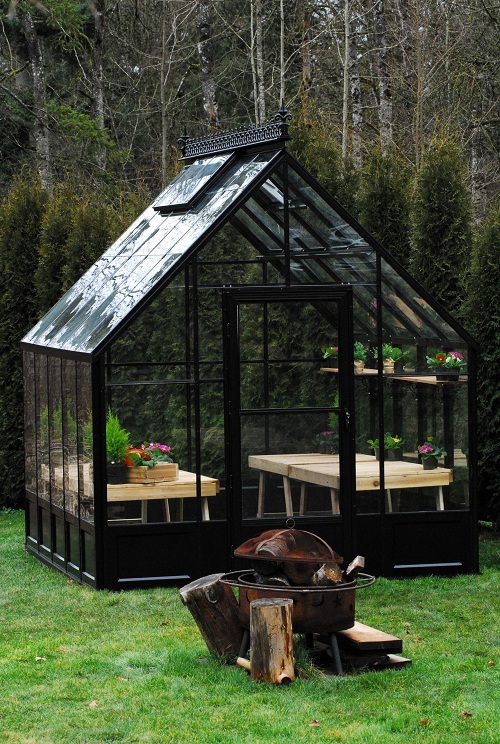 This greenhouse measures approximately 8' x 12' and is on sale for a limited time only! A beautiful greenhouse design, the aluminum frame is painted black and has single tempered glass side walls. The attractive 12/12 roof slope (which is about a 45 degree angled slope) adds to the beauty of this greenhouse, along with the decorative Victorian roof cresting and finials. As an added feature, the decorative base panels provide a fully finished look that eliminates the need and cost of a concrete foundation. All that is needed for the foundation is one row of 4" x 4" pressure treated lumber. Eave height is 5' 0"
Height to Center Ridge 9' 8 1/8"
Please note that shipping is not included. Please call 1-800-665-2124 to obtain your shipping fee or to receive a quote for any other size or paint color! You will receive a final confirmation of your order via email and any changes required can be made at that time. Size in picture may vary from actual size delivered.